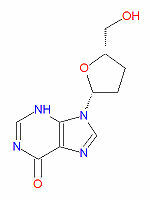 Didanosine (DDI), or dideoxyinosine, is a potent HIV-1 reverse transcriptase inhibitor that also acts as a viral DNA chain terminator. Treatment with DDI after long-term AZT treatment has been beneficial. Didanosine is unusual among nucleoside analogs because it does not contain a regular base or regular sugar, but instead contains hypoxanthine attached to a dideoxy sugar. The absence of a 3'-hydroxy group on the sugar prevents the formation of phosphodiester linkages which are needed for the completion of nucleic acid chains. DDI is metabolized to dideoxyadenosine triphosphate (ddATP), its putative active metabolite that competes with dATP. It is often taken with antacids because its stability is low under acidic conditions. It is sold under the brand names Videx® and Videx® EC. Possible toxic side effects including diarrhea, liver dysfunction, hyperuricemia, pancreatitis and peripheral neuropathy. Its IUPAC chemical name is 9-[(2R,5S)-5-(hydroxymethyl)oxolan-2-yl]-3H-purin-6-one and its chemical formula is C10H12N4O3 (MW 236.2273). The effects and toxicity of didanosine is increased when taken with ganciclovir, tenofovir or valganciclovir. DDI levels may be reduced when taken with tipranavir. The risk of peripheral neuropathy toxicity is additive for the DDI/zalcitabine combination. The most up-to-date information about Didanosine and other drugs can be found at the following sites. Didanosine - FDA approved drug information (drug label) from DailyMed (U.S. National Library of Medicine). Didanosine - Drug information for consumers from MedlinePlus (U.S. National Library of Medicine). Didanosine - Detailed information from DrugBank. This page was last modified 06:27, 3 June 2009.